Vitamin B-6 is one of the more popular members of the B-vitamin family and is found in fresh vegetables. 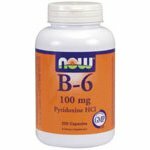 Clinical studies have shown that B-6 plays an important role in regulating homocysteine levels in the body. Homocysteine is produced as a by-product of the demethylation of methionine and can be toxic in elevated amounts. * Our Vitamin B-6 is screened for potency and purity. From the FDA's website: "As part of a well-balanced diet that is low in saturated fat and cholesterol, Vitamin B6 may reduce the risk of vascular disease. FDA evaluated the above claim and found that, while it is known that diets low in saturated fat and cholesterol reduce the risk of heart disease and other vascular diseases, the evidence in support of the above claim is inconclusive."